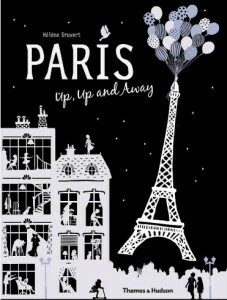 Lace-trimmed silhouettes and dark skies so black they’re almost blue; these are the images between the magical pages of Helene Druvert’s lovely new picture book called Paris: Up, Up and Away. In this lovely children’s fantasy the Eiffel Tower has grown bored and decides it is tired of standing (make that leaning) in the same spot and takes off for the day to explore the city. With the help of a generous cluster of balloons, the tower flies over the River Seine, visits a busy department store, and even experiences a refreshing Paris rain shower. The tower revels in the sunshine that returns after the rain and watches lively children play in the park. It does many other fun things until nightfall, when it is finally time to return to its place and turn on its lights to light the way for night strollers. This imaginative little rhyming book is the first installment in Ms. Druvert’s “Up, Up and Away” series. The second installment is Mary Poppins: Up, Up and Away, and the third is New York Melody. This book is thick and sturdy for heavy-handed younger readers, yet its pages are adorned with intricate, paper-dollish laser cuts and eye-popping designs that transform city scenes with the mere flip of a page. If you can’t take your little ones to Paris, this book may be the next best thing.